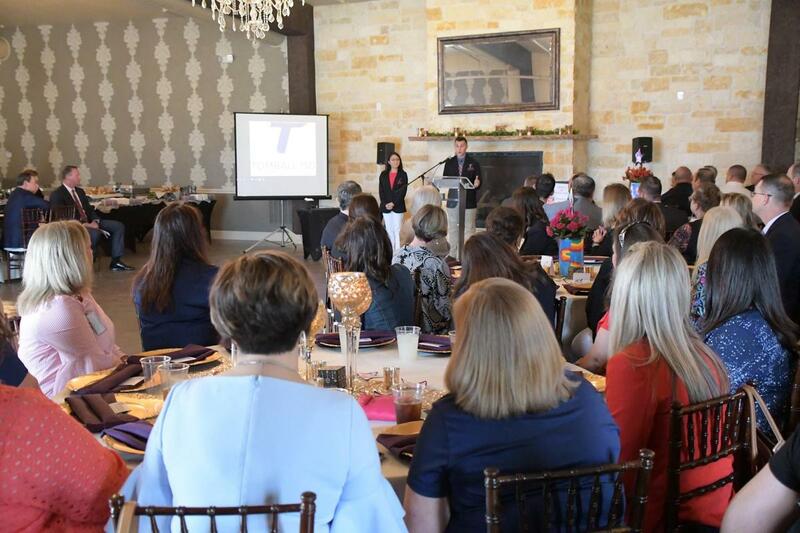 TOMBALL - With a captivating audience, Tomball ISD had the opportunity to reflect on its continued successes and commitment to education as over 200 community members joined together for the Second Annual State of the District luncheon. The event was in support of the Tomball Education Foundation and welcomed in TISD Board of Trustees, educators, students, administrators, city officials, and valued community members to Moffitt Oaks Event venue for an afternoon of celebration. The Tomball Memorial High School Steel Drums, under the direction of Chris King, welcomed guests to the luncheon with a medley of songs. The event kicked off with a welcome from Judge Lincoln Goodwin, Justice of the Peace of Precinct 4 as the MC. He was followed by Tomball Education Foundation President Susan Cline, who provided insight into the TEF. Student achievement continues to excel across the district and two talented students in TMHS’ Trinisa Fung and Tomball Star Academy’s Tomas Maldonado shared their experiences of being students in the district and credited their teachers for being change-agents in their lives. The TMHS Sax Quartet, under the direction of Andy Easton, showcased their talents with several performances throughout the day. Educators Allison Bearden of Oakcrest Intermediate and Brandon Batchelor of Willow Wood Junior High spoke on the impact the community makes in this school district and why teaching in Tomball means to much to each of them. Following lunch, Tomball ISD Superintendent Dr. Martha Salazar-Zamora took to the podium to deliver her annual State of the District presentation. She reflected on the past year and the many successes the district has experienced. She raved about TISD being the only straight A school district in Harris County and how that accomplishment reverts back to the outstanding student achievement that is all across the district. Salazar-Zamora went on to recognize the district for being honored on the AP Honor Roll, as an HEB Finalist in 2018 and being awarded a $75,000 grant for the robotics program. She also noted that over 16 million dollars in academic and athletic scholarships were awarded district-wide a year ago. “Tomball ISD students have excelled at the highest levels in academics, fine arts, athletics and FFA and our educators continue to serve as leaders and innovators in all areas, promoting success and competition within our district and beyond,” Salazar-Zamora said. The State of the District speech touched on the district’s growth over the last year, highlighted by an enrollment that surpassed 17,000 students, the launch of the Two-Way Dual Language Academy, the expansion of the GE model on campuses, the collaboration through PLCs and the implementation of student support services like Emotional Backpacks, video therapy, online learning modules and intervention resources. She spoke about Bond 2017 projects and district improvements as well as shared her excitement in being a model district for many others to replicate. For the growing district, the support of the Tomball community is invaluable. Salazar-Zamora credited the community for the district’s growth and success. She highlighted the recent partnership with LSC-Tomball and Harris County Public Library with the Tomball Community Art Showcase as well as events such as Principal Partners and Leadership Tomball that all involve members of the community. She expressed her excitement for Destination 2025, the new and innovative strategic plan, a long-range plan for the future of Tomball ISD that is currently being created. As Salazar-Zamora wrapped up, she thanked the Tomball Education Foundation, applauded them for their support and their success in raising funds to support TISD educators. The State of the District allowed supporters of Tomball to experience the talents of the fine arts department, hear testimonials from talented and high-achieving students and devoted educators as well as hear a reflection from the Superintendent of Schools Dr. Martha Salazar-Zamora on the State of Tomball ISD as well as a recap of many of the growth and achievements of this Destination District.